One-Pocket, more so than other pool disciplines, can leave a player between a rock and a hard place. 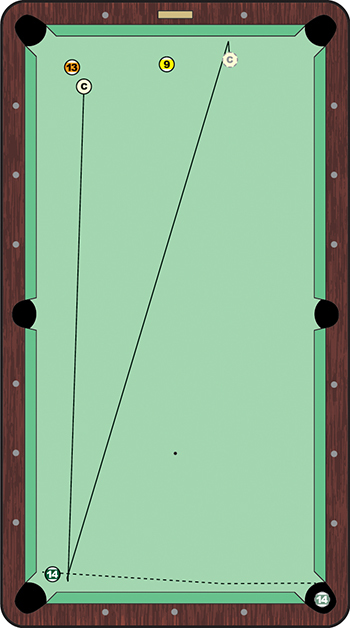 Unlike rotation games, where both players are keying on the same ball, one-pocket leads to outright defensive shots, one of which earned a spot as this month's Stroke of Genius. On the last day of the Accu-Stats "Make It Happen" one-pocket invitational, Tony Chohan and Danny Smith, both with a 1-3 record in the six-player round-robin event, didn't have a chance at the overall title. But the winner of this match would pocket an extra $1,000, so it's not like they were without motivation. In the opening rack, Smith was a ball from victory when he tried to bank the 14 into the bottom left pocket. An inch from falling, it left Chohan in a difficult spot, as shown in the diagram. Popping it out from the jaws of the pocket was the primary goal, but Chohan had more in mind. With a touch of inside English, "T-Rex" sent the cue ball toward the left edge of the 14. Clipping the bottom rail just as it sliced the edge of the object ball, the cue ball sent the 14 off the point of the corner pocket before rebounding back up-table. The 14 took a right turn across the table, ricocheting off the short rail before dropping in his pocket. The masterful turn of the tables helped Chohan get back in the game, but he didn't have much left, with both the 9 and 13 near the headrail. The two players traded safeties, but Smith ended up taking the rack. Chohan, thanks to the skill that let him pull off this kind of shot, bounced back to win the match and pocketed the $1,000 at stake.